The exact date of construction is uncertain, but it is now believed the work was conducted early in de Burgh’s tenure of the site, permission being retrospectively officially confirmed through a licence to crenellate in 1230 under Henry III. This first castle was probably of an octagonal design, running along the top of the ridge, protected by square and semi-circular mural towers, with a barbican guarding the eastern entrance. Inside was a 1.75 acre enclosure with a free-standing wooden hall. The walls were built of Kentish ragstone and Reigate stone cemented by a mortar containing mainly seashells, in particular cockleshells from the cockle beds of neighbouring Canvey Island. Ditches were dug on the north, east and west sides to protect the walls. By 1235, a park had been formed around the castle, including woodland, a fishpond, stables and a park lodge. Hubert had built this large turreted castle as a statement of his power. However, this led to him having enemies among the English nobles. 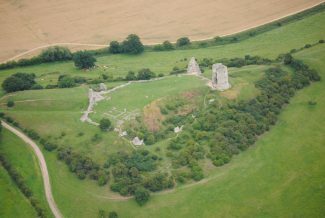 Hubert finally fell out of favour with Henry III; he was imprisoned and then finally stripped of Hadleigh Castle in 1239. Henry had a change of heart and released Hubert with a full pardon and gave him back his lands which had been confiscated. Hubert was able to live out the rest of his life quietly, dying in 1243 as a man of over seventy.